You Guys. This is a day that will go down in history. I am going to confess that I actually made something that was not peanut butter and chocolate flavored and I am pretty sure it’s one of my most favorite things I have ever made. Ever since I received an awesome package form R.E.D.D.’s Superfood Bars a few weeks back and tried their Mint Chocolate Chip Superfood Bar, I have been HOOKED on mint chocolate. I also just discovered that Bri has a serious love for mint chocolate chip that I never knew, so the two of us together are on a KICK. When I set out to do our meal prep for the week, instead of doing my normal peanut butter / chocolate variation, I set out to do a mint chocolate flavor…and now I can’t stop eating them. Even though nut butter is still involved, it’s almond butter and I believe almond butter has very subtle taste compared to peanut butter, which is why it works so well in this recipe. 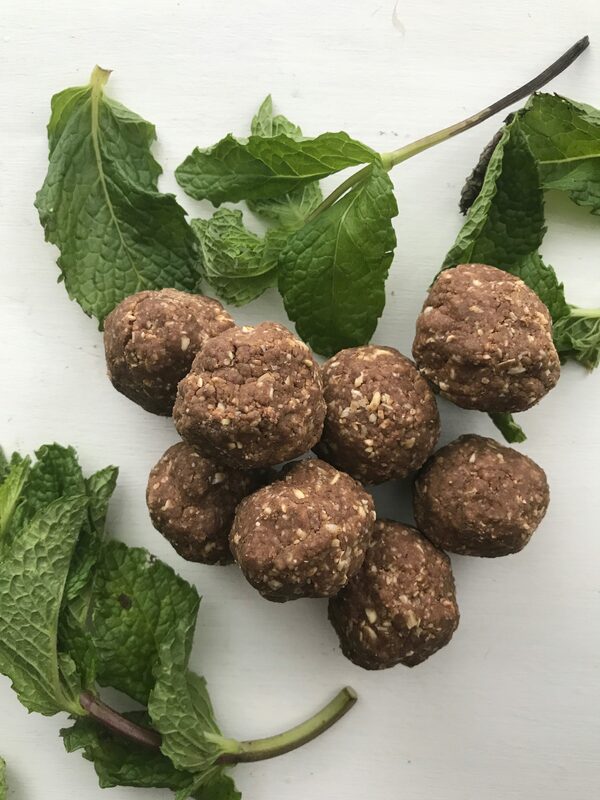 And although I do feel guilty for cheating on my peanut butter and chocolate combo, Brian and I both agree that this is our most favorite energy ball yet!! And before the recipe I wanted to remind y’all of TWO discount codes! If you haven’t jumped on the collagen peptide train, this is one worth getting on! I’ve used it everyday for almost a year now and swear by it! From gut health to skin health – it does it all!! The second code is for my new favorite R.E.D.D. Superfood Bars. They come if four flavors – chocolate, peanut butter, oatmeal and mint chocolate. I have tried them all and they’re all delicious, but if I had to pick, I’d say mint chocolate and peanut butter are my favorite. All of the bars are gluten and soy free. Contain 11 superfoods like, maca and maqui berry and little natural caffeine from yerba matte. Use code ASHLEY4FIT to get 10% off your first order of R.E.D.D. Bars. 1. Place cashews and oats in in high power food processor for about a minute or until everything is finely ground up! Add protein powder and cocoa powder and mix until incorporated. 2. Add wet ingredients and mix in high for about a minute until dough is formed. 3. If using chocolate chips, fold them into mixture. 4. Roll into balls (about a tablespoon each) of mixture. 5. Keep in fridge for about a week or in the freezer, but I guarantee they won’t last that long!